When we were house hunting, we had a pretty short list of features we really wanted in a house. Since we were looking to buy a house in a pretty competitive market with a budget on the lower end for the area, I tried to keep our expectations realistic. On aforementioned list, albeit towards the bottom, was a dining space. Brian and I could easily get by with just our eat-in kitchen (and did for many years in our first home!) 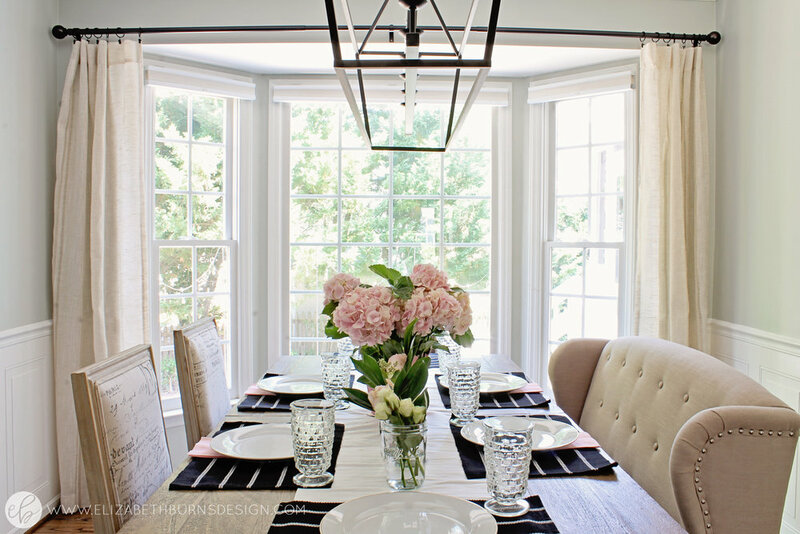 but since we enjoy entertaining, a dedicated dining room that can accommodate my large family (just barely!) was a wish list item I am so grateful we got with our new home. The bones of this room were not bad when we bought it - hardwood floors and crown moulding were already in place, as well as a chair rail. There was definitely a 90s builder grade vibe, though, with the popcorn ceiling, beige walls, and orange-y floor stain. 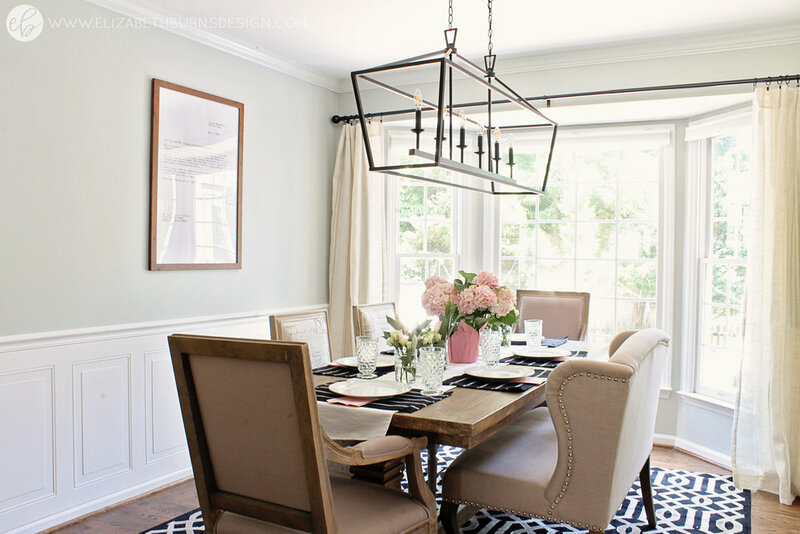 After LOTS of popcorn scraping, some paint, a DIY wainscoting project, statement light fixture, and a more neutral stain, this dining room feels much more our style and has become a favorite room in the house. 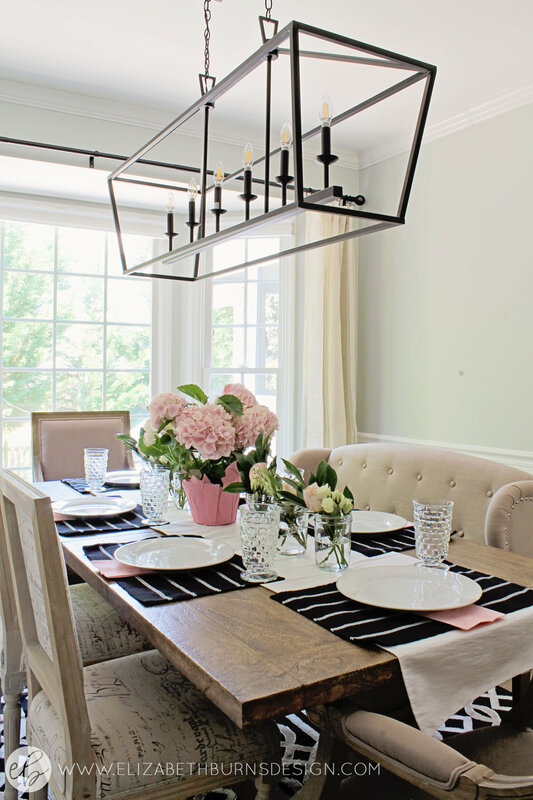 One of the most dramatic changes was swapping out the previous traditional dining chandelier with this six-light geometric pendant lantern in oil-rubbed bronze. It's on the verge of being a bit too bulky for this space, but I love the contrast it adds - it definitely makes a statement! Brian also spent a few days adding wainscoting to this room and the foyer. There was a chair rail already in place but the baseboard and chair rail profiles are very thin (maybe 1/4" at the edges) so we couldn't add anything too thick. I found a product at Lowe's called the WallDesign Recessed White Birch Wainscoting Wall Panel that intrigued me. At only $15 for a 4 foot run, I thought it was a pretty reasonable price for a wainscoting project. I also liked the fact that the pattern complemented our six-panel doors. It was definitely one of those projects that seemed like it would be easier than it was (Brian ran into issues trying to seam the panels together) but in the end, I love it and I think it is a very affordable option for DIY wainscoting. 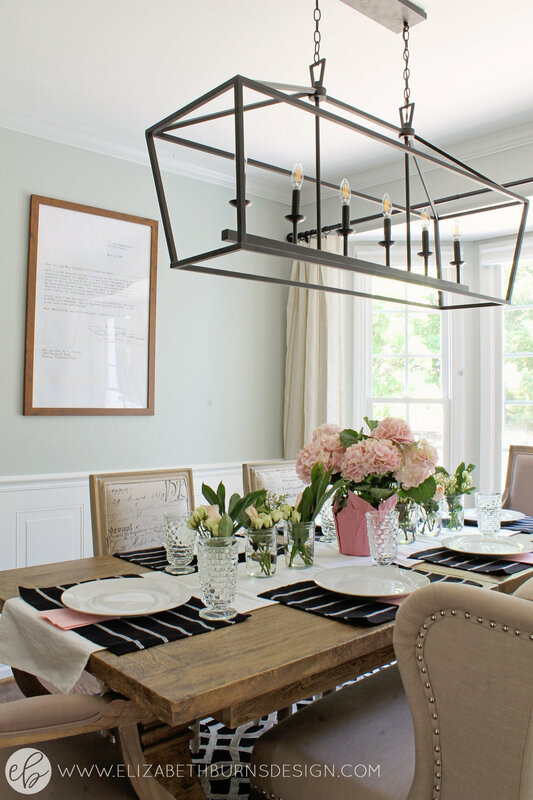 Our last dining room had big windows and not a lot of wall space for art, so in this room I needed to come up with some large-scale yet budget-friendly art projects. 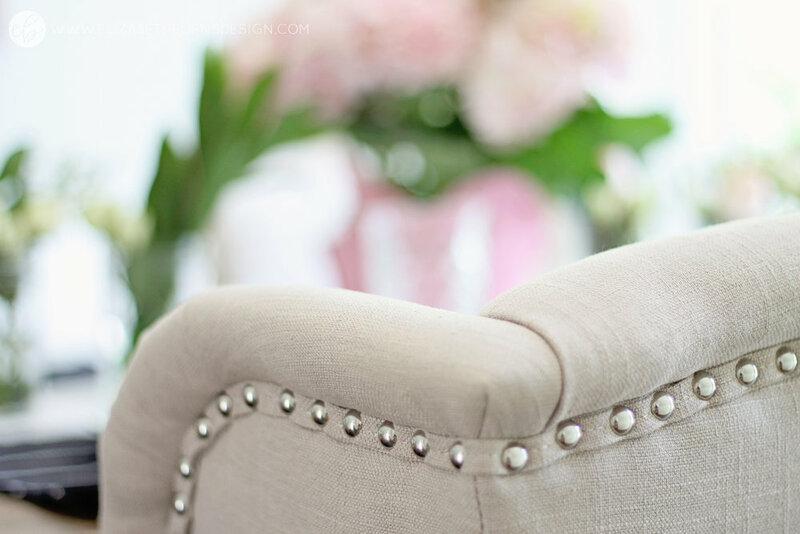 When perusing Pinterest one day, I saw a gallery wall project by Blesser House. I loved the warmth of the wood frames and the vintage look of the prints. 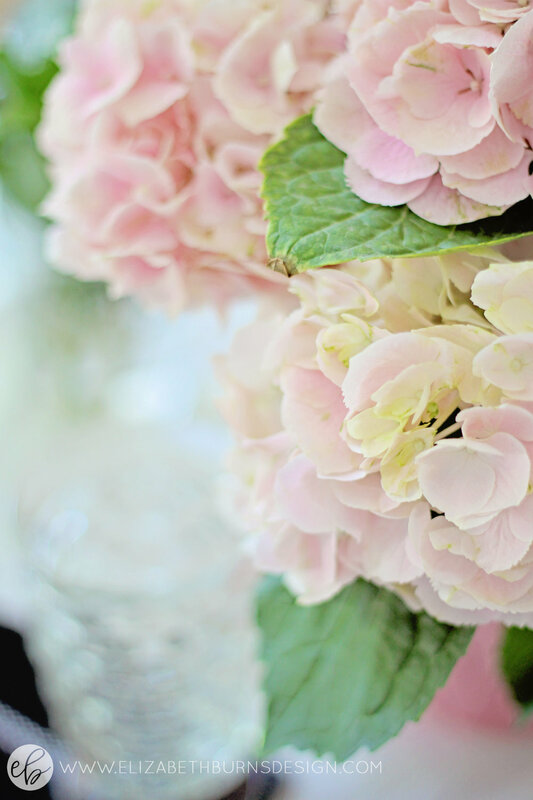 (She is kind enough in her post to offer the botany prints free to download.) The prints in her home are 18x24 color engineer prints, but that would have been too big for my wall. I went with the 11x14 Honey Belmont Frame (they are usually on sale) and sized the botany prints down to 8x10s. This made printing a lot more affordable (I had Staples print these on cardstock for around $2 for the set) and the frames were a lot less, too. I think the project cost around $35 total. One of my favorite projects ever is this next art piece. Years ago, I bought a nightstand from Goodwill to refinish. While I was prepping it for paint, I found a typewritten letter tucked away in the drawer. I opened it up and found that it was a letter from 1982 sent from Paris. It was a quite lovely thank you letter from actress Olivia de Havilland (who played Melanie in Gone with the Wind) to a family in Virginia who had sent her a bouquet of flowers. I love this letter for many reasons but since the letter is so small-scale, I never felt like it had a very prominent place in our house. I decided to try blowing it up on a color engineer print from Staples and seeing what happens. Worse case scenario, it is a blurry failed mess and I'm only out a couple of bucks. 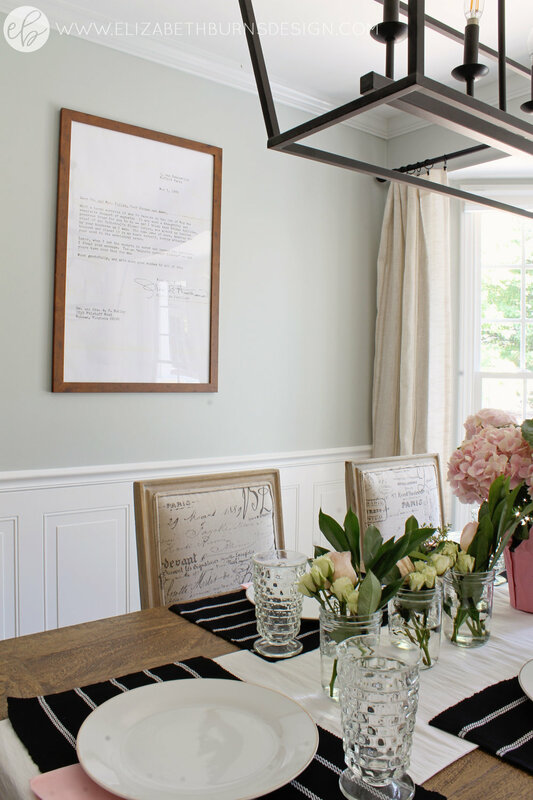 Luckily, this DIY project turned out well and I LOVE that this letter is now larger scale and more of a conversation piece. Admittedly, another reason I really wanted a dining room is because I love my dining room furniture so much. SO much, y'all. I scored my beloved trestle dining table on clearance for $330 and I think I would have cried if I had to get rid of it. Once we got all of the furniture and rug in place in the dining room, the bay window seemed a little stark. We installed an oil-rubbed bronze drapery rod and some nubby linen-look drapes and it really softens up the room. We're still debating on adding a barn door to the doorway leading into the kitchen (I think visually it will trick the eye into thinking the doorway is larger) but it would cover up a light switch so we'd have to figure that out. It's never simple, I tell you! What has been nice is being able to take our time with this house when it comes to renovating. In the past with flips and even our personal homes, we've put ourselves under some intense deadlines and burned out. I think since we're taking things slow, we've been able to make better decisions and not rush into a project just to cross it off the list. Thanks for reading - hope you have a great weekend!